Probably the best “games” movie yet, Mockingjay Part 1 takes the audience back to the dystopian world of Panem at a time that there is talk of revolution against the seemingly utopian capital that prospers while the rest of the world is in turmoil and eternal servitude. Although it is the best in the franchise of movies so far, it falls short of where it should be. Most notably, the movie takes Oscar winning and nominated actors and makes mediocre performers out of the them. Even though his screen time is brief, Hutcherson is the only actor who sells his character, especially in the final moments of the film. Lacking in quality of dialog and performances, this film fails to live up to the expectations of the audience in such a successful franchise of movies and best-selling books. Following the destruction of the games’ theatre and District 12, Katniss (Lawrence) finds herself battling her inner demons and psychological instability in the thought-forgotten and destroyed District 13. It is here that she is confronted by the president of the rebellion President Coin (Moore). Though somewhat reluctant at first, Katniss decides to be the face of the rebels after she realizes her entire home district was destroyed along with most of its people. Known as the Mockingjay, Katniss becomes a new kind of celebrity–one who is Martin Luther King-like or a de facto Joan of Arc. The over-arching goal of the film is for a small band of rebels to break into the capital and rescue Peeta (Hutchinson) and the other victors from the clutches of President Snow (Sutherland). 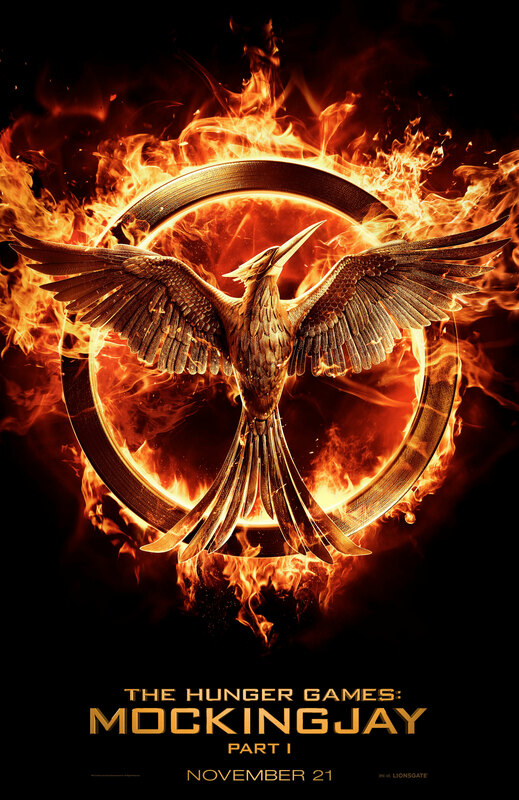 In this movie, Katniss becomes a full-fledged leader of a rebellion. A common theme throughout the movie is the director’s and writers’s belief that Katniss is actually more exciting than the revolution in and of itself. This is seen in the weak dialog and performance given by Lawrence, as well as most of the rest of the cast. Ironically, the performance of most of the characters is indicative of the lackluster rebellion propaganda video Coin and Plutarch set to create to generate enthusiasm in the hearts of those who desire to overthrow Snow and the capital. Unfortunately, the character development and exposition are lacking in this third installment of the franchise. However, the director and writer are not fully to blame because Mockingjay is arguably the weakest book in the series. This is where the producers of the film should have made sure the director and writer added and modified material to be more visually compelling in order to sell the story, characters, and setting more effectively. Film scholar Linda Williams, who principally studies horror, has written that there are four elements that are required for any successful horror (or, can also be used to describe action/adventure/fantasy) movies, and those elements are: narrative, spectacle, setting, and characters. Beyond the definitions of each, there lies a great importance in each of them. In order for this genre of movie to be truly successful (beyond box office numbers) and artistically important is to have vibrant, unique, visual settings. The settings in this film are barely distinguishable from any given dystopian world that we have been inundated with over the last few years. It needs dynamic strategic characters through whom the story can be advanced, and this film has overly used or one-dimensional characters that are less than memorable (with a few exceptions). The narrative needs to be told with sufficient exposition to immerse the audience into the story, but enough spectacle to keep the attention and to advance the plot visually. Both narrative and spectacle are not kept balanced, and leave the story feelings very par-for-the-course. The biggest element that the previous movies had going for them was the proliferation of action sequences that kept the anxiety levels up and hastened the pace of the film. This film, however, should have played it closer to the book by having more action and less camera work by the ragtag crew. One thing the movie does very well, is showcases and highlights the fact that our society, even today, is heavily mediated. Throughout the series, the narrative and characters often comment on the mediation of society. Mediated in that most everything is documented, broadcasted, recorded, with the applications of gatekeeping and filter applied. It shows the dangers of a society who loses themselves in the technology of broadcasting that which should not be seen. Film critic Adi Robertson comments on the idea that Katniss has become that which she actually opposes. “The most positive interpretation of Mockingjay is that it’s a daring postmodern step past simple satire of the reality TV-loving masses. Katniss was a hero of action in The Hunger Games, taking her sister’s place in the Games and manipulating the Capitol into changing the rules to save her. She was a hero of reaction in Catching Fire, unwittingly playing out her part in a larger scheme. Now, Mockingjay is creating its own version of David Foster Wallace’s hero of non-action in Infinite Jest: not a character “beyond calm, divorced from all stimulus” but one that genuinely has no existence or effect beyond her appearance on a screen within a screen. A character who, after years of manipulating her appearance, has actually started to become television” (Adi Robertson, 2014). Hopefully this film is like the Halfblood Prince Part 1 in that is is setting up the audience for the amazement and astonishment yet to come. Hopefully, the editors and director can craft Part 2 in such a way that the characters are as exciting as the rebellion, the setting becomes more distinguishable from its counterparts, and the dialog generates excitement for the rebellion in the heart and minds of the cinema audience as well as the characters in the movie itself.